Meet the nene (pronounced “nay-nay”). These geese (Branta sandvicensis) are currently found on only four islands in Hawai’i: Maui, Moloka’i, Kaua’i and The Big Island. They are descendants of the Canada Goose, at least a couple of which either had a very bad sense of direction and/or got blown seriously off-course while migrating a few hundred thousand years ago, give or take a few. I imagine that after their prehistoric ancestors recovered from their trans-oceanic journey, they took one look around them and said “To hell with those brutal North American winters: we’re gonna stay right here and raise us a family!” Or words (or quacks) to that effect. The nene’s coloring has modified over the millenia to more closely match the terrain they are found in. In this image, their body feathers are similar to the color of the lava they’re walking on, and notice how well their heads blend into the shadows on the lava behind them. Even their goslings do a great job of blending in! The nene can still fly, but they spend most of their time walking. Their feet have adapted to the sharp lava by becoming thicker and more padded on the bottom, and they also have less webbing between their toes than ordinary geese. 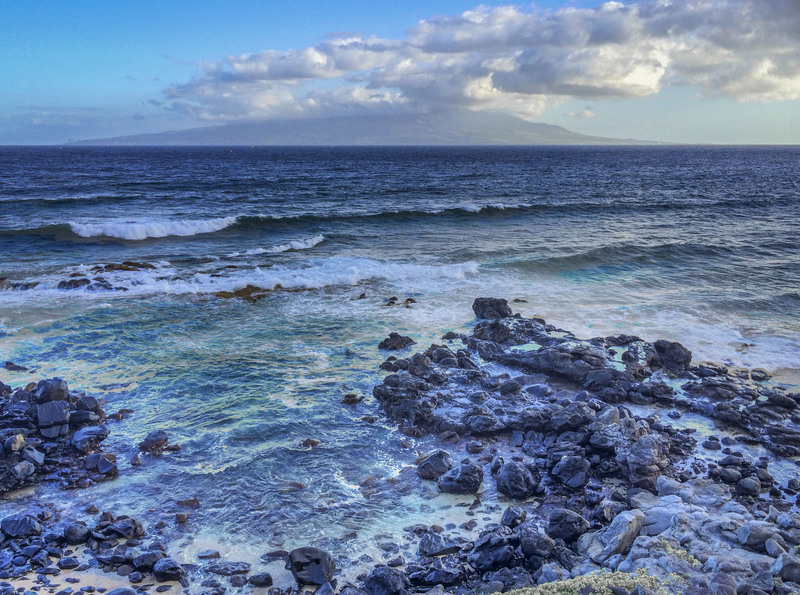 There’s very little fresh water in Hawai’i, and what there is flows quickly to the sea. So these geese have adapted to their dry climate, not just by mostly walking (instead of swimming or flying) but also by developing the unique ability (among goose species) of being able to breed on land instead of in the water. Finally, they differ from all the other North American geese in that they breed during the winter instead of the summer. Winter is the rainy season in Hawai’i, and thus there’s more plant growth, which translates into more food for the parents and their young. 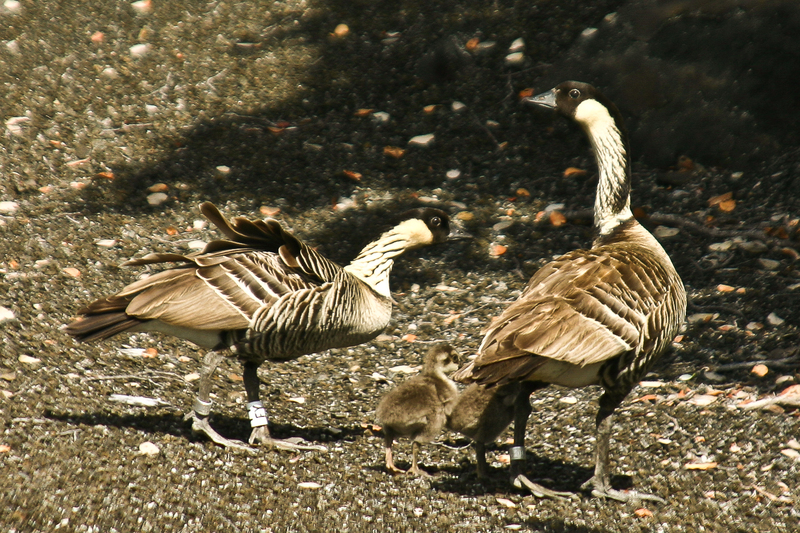 The nene is the official state bird of Hawai’i. And indeed, after the thousands of years the species has called Hawai’i home, they are no longer Haoles (foreigners), but have earned the honor of being considered Kama’aina (locals). 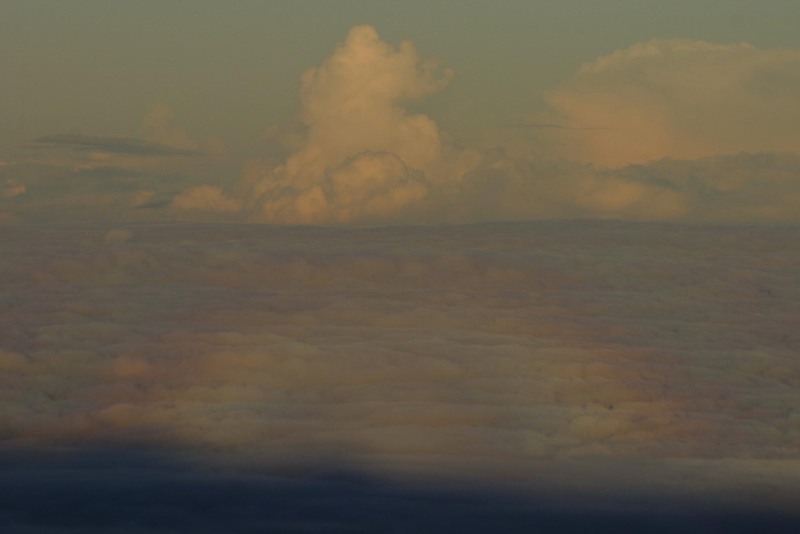 For sunrise images, I think Haleakala takes the cake…or would that be poi? If you’ve witnessed it, you know what I mean, and if you haven’t, I hope it’s on your Bucket List. For the uninitiated, Haleakala is the tall volcano on the island of Maui in the Hawaiian Islands. By tall, I mean over 10,000′ tall. Which means the summit is above the clouds. Which means that even if it’s raining at sea level, where your hotel is most likely located, you’ll be above the clouds on Haleakala. Cool! Make that cold…REALLY cold. I don’t know if I’ve ever been colder in my life than in Hawaii, standing on the rim of Haleakala in pitch darkness at Zero-Dark-Thirty in the morning, waiting for the dawn. The first time I went, I was 23. Hearing it would be cold, I bought a thin sweatshirt at a tourist shop, and made sure to wear my long cotton pants…and just about died of hypothermia! Fast forward to age 45 and my second visit to Haleakala. They say experience is the best teacher. I packed a down jacket, fleece pants, gortex rain pants (to block the wind), wool socks, hiking boots, down hat, and gloves. Mittens would’ve been warmer, but I had to be able to operate my camera equipment. I wore the above outfit for a couple of hours out of my two week stay, and couldn’t have been happier that I had brought it along. I was still cold, but pretty sure I’d live through the experience this time around. The first time, I wasn’t as certain. To do it right, in my opinion, you need to arrive on the rim of the volcano when it’s still pitch dark. Which sounds easy, until you realize that it’s a 2-3 hour drive from your hotel at sea level, up a narrow winding mountain road with hairpin turns galore. So you get up at 2:30 AM, or thereabouts, and set off for the summit. Donning as much as possible of your cold weather gear inside your sub-compact rental car will get your blood flowing to your extremities before you step out into the biting cold and it stops again. It’s often very windy as well, which in addition to bumping up the wind chill factor, means you have to keep a (gloved) hand on your tripod at all times. You may well find several dozen other folks in the parking lot, waiting for the dawn. The smart ones remain in their rental cars, sipping their coffee in relative comfort. The foolish ones, you among them, leave the warm haven of their car and search for a place to stand with the best view to the east. The stars are absolutely stunning, and you realize how few of them you actually get to see back home. I’ll put a couple of images of constellations I shot on Haleakala in another post. The night sky without light pollution is a breathtaking sight. See yesterday’s post for my Dark Sky lecture, if you haven’t read it already. Over the hour or so that it takes to go from pitch darkness to sun-over-the-horizon daylight, you will marvel at the spectacle, as the sky lightens and turns various hues. Gradually, the terrain becomes visible, and you realize (assuming you haven’t been there before in the daylight) that you’re standing on the rim of a massive volcanic crater, miles across. There is only one plant that grows here, so for the most part you’re looking at nothing but lava in various shades of reds, browns and blacks. It’s so barren here that the NASA astronauts trained for their moonwalks in the crater. I can’t help envying them, as they must’ve been nice and warm in those spacesuits! Once the sun is rising in the sky, it does start to warm up. Trust me on this. Eventually you thaw out and are able to move more than your shutter finger. It will happen. I don’t have too much shooting advice to give you here, other than to dress like you’re going to Antarctica. Be sure to get some shots of the stars while it’s still completely dark. As the sky begins to lighten, play with both wide angle and tele lenses for a nice variety of shots. Immediately after the sun comes up, you can get some very dramatic shots of the long shadows in the crater. And be ready for the first ray of sun to peek over the clouds on the horizon, as in the image at the top of this page. After the sun is up, and you’re on your way down from the rim, look to the west and you may be able to spot a Glory, which is a circular rainbow that forms on clouds. They’re fairly common to see from airplanes, but less commonly seen from terra firma, since you have to be on a mountain above the clouds.